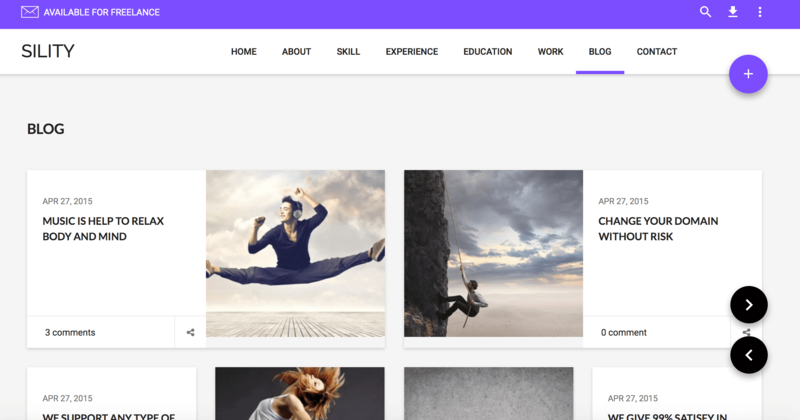 The new Sility vCard, CV WordPress Theme was created using Google’s Material Design. The theme is utilizing design trends such as flip page, ample white space, and the type of large block and font that is indicative of the clean lines of Material Design. Something that many people have noticed, is that Material Design is to the app world like IKEA is to furniture. It should be easy to build, fix, make changes to, and not cost a fortune. Items designed using Material Design should look clean, shouldn’t be messy, and ought to also look modularized. All of this is true for the Sility vCard, CV WordPress Theme. It looks so nice and it’s possible to believe that people will create an online resume just to use it. Users will enjoy the interactive resume and tech forward appearance. Part of this design trend is all about interfaces and the vCard has those in abundance. A quick roam through the screens is enough to display the finer points of this new CV/Portfolio WordPress theme. The idea of Material Design was to move past “flat” and back to the type of clean layers that the eye has an easier time to focus on. And this WP theme definitely has that. The UI is tactful and responsive. Users will be flipping left and right on the “Work” tabs and selecting projects in a way that is valuable to a positive experience and end result, and yet it all still feels a bit organic. If used to its full functionality the end user could spend all day being dazzled on that screen alone.